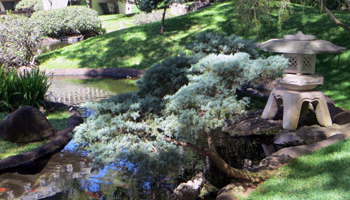 A Serene Japanese Garden Near Waikiki and Honolulu. The Japanese garden at the University of Hawaii Manoa Campus isn’t exactly what you’d call a major Honolulu tourism Hawaii attraction. But if you’ll be out scenic Hawaii sightseeing around Waikiki and Honolulu during you Hawaii vacation, it’s a beautiful place to discover some of the cultural diversity that makes Hawaii such a unique destination. Better still, it’s a uniquely beautiful place where you can enjoy a moment of tranquility and take some outstanding family photos. 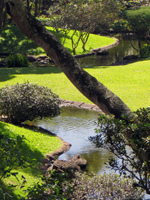 Designed by Japanese landscape architect Kenzo Ogata, this garden was constructed along an idyllic section of Manoa Stream by a consortium of businesses and specialists from Japan, Hawaii, and the United States. The garden was blessed by Prince Akihito and Princess Michiko of Japan; and they re-visited the garden as Japan’s Emperor and Empress. 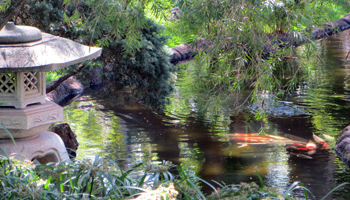 Click for a detailed description of the symbolic elements found in this Japanese Garden (link opens a new window/tab). The Japanese Garden at the University of Hawaii isn’t one of those Hawaii attractions that you go to because there’s so much to do. In fact, it’s not even that big. But it is a place where you can go to enjoy the best of Hawaii’s natural beauty. In other words… it’s a place to take some very picturesque photographs. And that’s probably the main reason most people go there. Many a couple has taken their wedding photos in this garden. My wife and I took anniversary photos there. And a lot of people just like to frame the scenery. So although it’s not an activity I’d plan my entire Hawaii vacation around, this is a quick and worthwhile stop on your scenic Hawaii sightseeing tour. It’s almost directly inland from Waikiki, and it’s just a short distance east of downtown Honolulu. 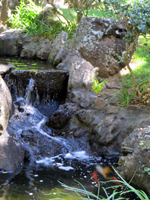 You can easily stop by on your way to or from various nearby Hawaii attractions such as Manoa Falls (farther upstream), the Lyon Arboretum (near the falls), Waahila Ridge (up the hill overlooking the garden) or the Mu-Ryang-Sa temple in the next valley over. I believe the Japanese Garden is open 24-hours; so you can also see it by moonlight if that’s your preference. There’s also a nice grassy area where you can enjoy a picnic lunch. Just make sure you bring something to sit on, because the ground is often wet. After all, it’s next to a stream in a valley that tends to get a lot of rain. The only other consideration you’ll have to worry about is parking. You’ll have to pay for parking any day except Sunday; and even then you might have difficulty finding a stall. I’d wait until after 2pm because many of the students are done for the day by approximately that time. Otherwise, go on a weekend.